So the DH has always been supportive of my hobbies. Recently he built a closet off my sewing room It is actually the "walkway" from our house (my sewing room) and the second story of his garage. We never use it to get into that space so he suggested a big closet. It has sloping ceilings on both sides. I wanted a space to hang tops when they were in the queue to be quilted. I had come up with a design but was not convinced it would work. So DH come up with this idea - I started with only two poles as I was not sure before we did it .... but after having hung them up, I can not wait to go the Home Depot for more!! Great Ideal, kudos to hubby. to hang our clothes when I was a child. How nice for you to have this space. 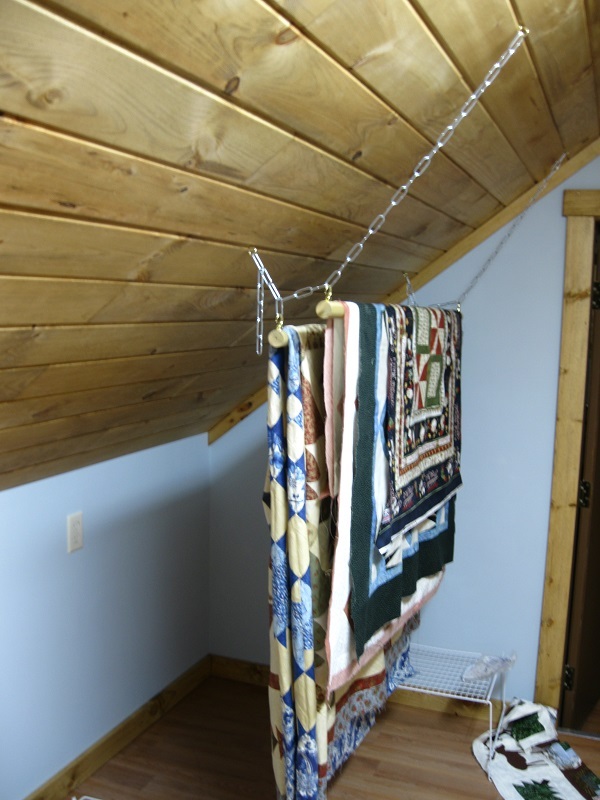 what a wonderful way to hang quilts! How very clever...like the quilts also. Your DH's closet solution has solved a problem that has been bugging me for 4 years! And MUCH cheaper than the $1700 I had feared!! Yay! Thank you for posting pictures of it. Wow, that is cool. So simple! Genius husband! Thanks for posting this. Very clever! What a keeper your man is! Thanks all - yes the hubby is a keeper (OBTW - he is also an enabler - lol). This works out so well I can not believe it. and take up so little room. Also if it is ever in the way you can move it, remove it, make it wider, make it shorter, lengthen the chains etc for very little money. 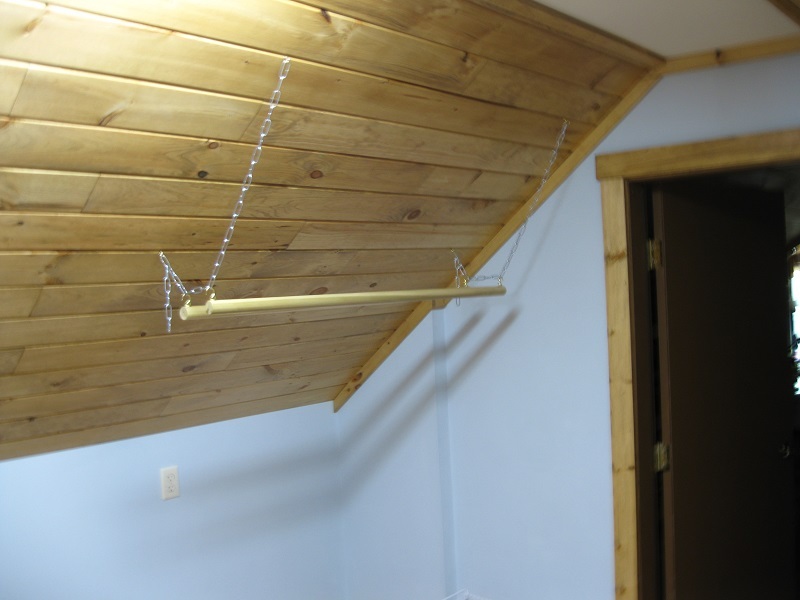 FYI, for those who are interested, I used pine closet poles and put urethane on them to seal the wood. I used large safety cup hooks on the poles and screwed them into the top of the pole so that the pole did not roll around when putting a on or taking it off. We also had put that tongue and grove on the ceiling and the Hubby just put the screws into the groves so that it did not mare the boards. Now off to fill up the rest of the space(lol)!! Humm .... there is the Keepsake Quilting tent sale this weekend .... maybe I should go? Really great way to store your tops. Thanks for sharing. That is just so clever! Kudos to you both. Super idea!! Thanks for sharing! Thank you for the idea for my closet in my sewing room!!! And thank your husband as well!! This is perfect for me. I just need to show my husband your pictures. What a good idea! And what a great space! I'd love to have a big walk-in closet to hold all my quilting/sewing supplies....and finished tops!